The LaPerm has achieved Championship status in CFA! LPSA has the first CFA Grand Premier! Uluru BC Cloudfeet of Cavaliercats, bred by A.D. Lawrence, Cheryl L Cook, and Paula Beall. Owned by Cathy Hurley. Welcome to The LaPerm Society of America, or LPSA as we are known. 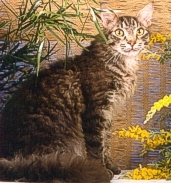 The LPSA was the brain child of A.D. (Andy) Lawrence after getting her first LaPerm from breed founder Linda Koehl. The purposes for founding The LaPerm Society of America were that we wanted to not only better the breed, but also have a core group of people willing to work together with respect to thoughts and policies in raising kittens. The LPSA is dedicated to the betterment of the LaPerm breed and furthering their advancement in CFA and other feline registries. As former Secretary/Treasurer of The LaPerm Society of America, Andy worked closely with Linda Koehl, breed founder. They were the two founding members of this club. The LPSA is the original organization promoting the LaPerm as a breed. Anyone interested in the LaPerm is welcome to join our club as an associate member and we welcome inquiries for people interested in helping to promote the breed by showing and/or breeding. Breeders promoting the breed at shows are eligible to become voting members of the club after one year. We produce a quarterly newsletter; and in it we strive very hard to provide information for the health of the cats as well as informative articles on the breed itself. We have been very fortunate in that approximately half of our members have not joined because they have LaPerms, but rather because the newsletter is so informative that it is beneficial to any breed of cat. This gives us a wonderful means of meeting new people and sharing our information.